Foot biomechanics is the study of how the foot moves during the gait cycle. You wouldn’t build a house without getting the foundations right, and it is the same with foot biomechanics and sports injuries. 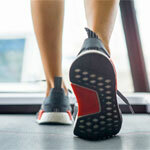 An assessment usually involves walking or running on a treadmill. In some cases the professional will simply watch the way that you move, looking in particular at your feet, ankles, knees, and hips. In more specialist settings, a video recorder will often be set-up behind the treadmill, which will record film of your gait cycle and often force plate data is used to analyse how the foot contacts with the floor and the timing of contact in more detail. As well as a number of biomechanical abnormalities the professional is looking to see if the foot overpronates (rolls in or flattens) or over supinates (rolls out). Read more on gait analysis. Overpronation is often recognised as a flattening or rolling in of the foot. Pronation occurs naturally as weight is transferred from the heel to the forefoot when walking or running. A certain amount of this is natural and important for absorbing shock but in many people, the foot rolls in too much or overpronates. This causes the foot to flatten too much, which in turn causes the ankle to rotate inwards, which in turn causes the knee to roll inwards and so on. This can increase the risk of injury as the Achilles tendon and other tissues have to work harder. Identifying and correcting overpronation is important in preventing many lower leg, hip and back injuries. Read more on overpronation of the foot. Oversupination is the opposite of overpronation. Here the foot fails to roll in or flatten sufficiently and so is unable to absorb shock and impact forces on the foot. Often athletes who oversupinate will have a high arch and a less flexible foot. Read more on over supination. A claw foot or Pes Cavus foot is a genetic defect in the foot with a high arch. Claw feet are relatively inflexible. This will often be associated with very tight calf muscles at the back of the lower leg. Foot drop is a symptom rather than a condition or injury. It describes the inability to raise the foot upwards (dorsiflex the ankle) as if pulling the toes up towards the shin. A patient with foot drop may drag the foot along the floor when walking. Or, in order to combat this, they may raise the hip and knee higher so that the foot clears the ground. They may also slap the foot back to the floor once the heel hits the ground as they cannot control the downward motion. Injury to the peroneal nerve (peroneal nerve palsy). Injury to the ankle dorsiflexor muscles, such as Tibialis Anterior. Muscular conditions such as Muscular Dystrophy. Neurodegenerative disorders such as Multiple Sclerosis. Motor neuron disorders, e.g. Polio. Following surgery (such as knee replacement). This may be due to a hematoma causing compression or irritation of the nerve which is temporary, or nerve damage during surgery. Habitual crossing of the legs when sitting – compresses the peroneal nerve. It is important to establish the cause of foot drop. In some cases, it will be obvious and in others, it may be more complicated. If you have foot drop you should visit your Doctor who will observe the injury and look at your medical history for possible causes. If the cause is not clear then diagnostic tests such as an MRI scan, CT scan, EMG (electromyography – to look at the nerves) or blood tests for detecting conditions such as Diabetes. Treatment of foot drop varies depending on the cause of the problem and how temporary or permanent the condition may be. A foot drop splint is often the first line of treatment. These help to hold the foot up off the ground to make walking easier. These tend to be plastic splints which are inserted into the shoe. Physical therapy may be used to ‘re-educate’ a patients gait cycle (walking pattern). A physical therapist may also be used in treating the underlying cause of the foot drop. For example a back strengthening rehabilitation programme for those with spinal canal stenosis. Nerve stimulation may be effective in those which dropped foot is due to a stroke. A battery operated unit may be strapped to the leg just below the knee, or in some cases, a tiny stimulator may be implanted within the leg. Treatments for other causes of foot drop may include epidural or steroid injections and anti-inflammatory medications. Surgery may be required in a number of the conditions listed above, usually, once non-surgical treatment has failed. 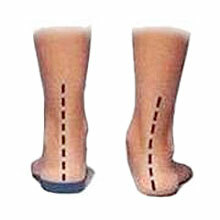 Surgery will vary depending on the cause of the drop foot. It may be aimed at the cause such as with spinal canal stenosis or other back problems or may be used to fuse the ankle joint to prevent the downward drop.